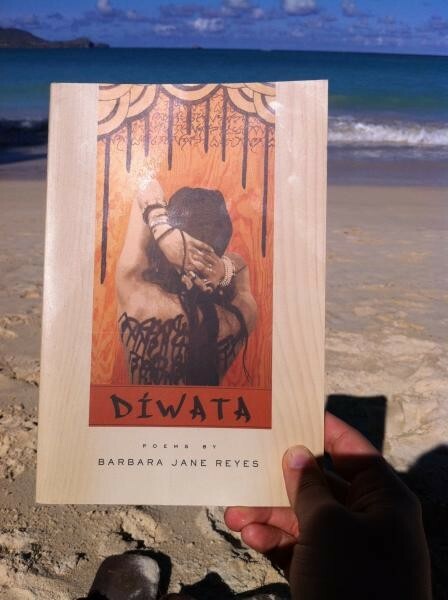 Next up on my beachshelf is Barbara Jane Reyes' newest collection, Diwata (BOA Editions, 2010). Although I've never taken a class with Barbara, her poetics, criticism, editorial vision, community activism, generosity, and overall badass-ness have deeply influenced me (and many others). Being the generous poet she is, she agreed to answer a few questions about her work. Thanks Barbara! CSP: Your new book, Diwata, is populated with Diwata, Duyong, Aswang, Eve, mermaids, a wolf spirit, El Mas Supremo, and many other “mythic” and storied beings from Filipino, Western, and indigenous cultures. How did these beings enter your work? How do you approach writing and re-writing mythos? What have you learned about “traditional” storytelling by engaging in “mythmaking”? BJR: These beings enter my work because I am always looking for someone other than myself to “tell the story,” or to be the speaker, as I prefer to think about my own stories, and those of my family, within the context of these larger cultural and historical narratives. If my grandfather survived the war (WWII), for example, then what did his ancestors survive? Because I can’t knowledgeably answer this question, because I don’t know the names of so many of my ancestors, because I do not know the details of their lives, I invent, I speculate, I turn to myth-making. I love that traditional storytelling is simultaneously fluid and grounded. Some questions I ask myself: What does it mean, how does it affect the work, to write from historical or “timeless” perspectives? What happens when I try to speak outside of personal experience and contemporary, popular culture? Also, I think of the long life a story has when told in figurative voices. Aesop’s fables, and biblical parables have remained with me since childhood, and I think this is because the stories were presented to me as still or moving pictures from which I have to draw my own conclusions. I wonder about other perspectives on a well-known enough story. What voices have we not heard, what perspectives do we take for granted or neglect or fail to consider? Whose versions of the story are suppressed or repressed and why? I’m intrigued by your idea that ancestral stories create larger--and perhaps longer--cultural and historical contexts/narratives for contemporary experience. The figurative voices throughout Diwata do seem to radiate a kind of haunting historiography combined with an immediate presence within the present. And I appreciate the questions this brings up for you, especially thinking of the feminist and racialized interventions that you make in the retelling--discovering new, neglected, or suppressed voices. So my next question, then, has to do with form that these figurative voices and ancestral hauntings take in your work. More simply, why do you think many of these stories emerge within the prose form in Diwata? Why do some voices/stories incarnate in what seem to me like choruses, incantations, and lyric songs? Yes, I have come to poetry because it is a place for those suppressed voices to speak, and to do so beautifully. More personally, I have found myself in poems and stories when I could not find myself in other texts. I’ve come very belatedly to a transcript of F. Sionil Jose’s speech at Stanford University in 2005. In his novel, Tree, there is balete tree, a sapling, surrounded by vines. The vines grow around its trunk, become the trunk, and ultimately strangle it to death. I think many of us can identify, empathize as a community, and as individuals with the sapling in this story. “Literature is myth making,” he states, and I think about the opportunities I have as a writer to “myth make,” and how form is one way of telling or reframing. Think of the ramble and stream of a lot of story, the everyday kind of story that happens when we gather at a kitchen table, a barbecue pit, a campfire, in an uncle’s garage; these feel like prose to me, spontaneous, informal, full of digression, asides, listener interruption. This is part of the fluidity of story, as in “Again, She Tells the First Story,” in which she breaks from the story to address the audience directly, “You have heard this one before, no?” Perhaps someone in the audience is looking bored or impatient, and so she summarizes a bit before returning to the story she originally meant to tell. In contrast, I think of the incantations, lyric songs of formal, ritual situations. Think of the verse we recite when we pray, when we attend religious ceremony. I haven’t attended church in years, nor have I recently recited the rosary or a novena, but I remember the hum and buzz of the congregation, being a part of that, as in the call and response of the Litany of the Blessed Virgin. You feel like one intoning body in this shared spiritual experience, tapping into a higher power. Still, not all shared spiritual experiences are solemn. With “Upland Dance,” I tried to capture the rhythm and pace of a choreographed Ifugao dance performance I attended in San Francisco. And of course, dances are also narratives. Similarly, with “Medicine Song,” I wrote that poem while watching a pan-Native American drumming/prayer circle in Berkeley. Not knowing what specific things were being said, I let the rhythm tell me story. And then there are the rhythms of my own forays into the natural world. Is it possible to talk about “rhythmic prose,” prose moments that are full of rhythm? In a couple of my hikes, I’d get to a point where all I could hear/sense was the pacing of my own footfalls, only to be jarred by a hawk’s screech overhead. So then I’d have to stop; things around me would slowly come into focus. I felt like a zoom lens, being so still so that I could focus on a solitary hummingbird, and see how close I could get to it and not startle it. And then a panoramic view, Half Dome below and in the distance from the top of Glacier Point. Paddling a kayak in the estuary, I could forget about everything but the water, the sun, and the sound of my own movement. So it’s just the rhythm of the paddling, which yields both streams of prose, and musical poetic lines, depending upon the point of view from I which I tell the story. In my two estuary poems, the first is prose, internal, personal. The second is verse, sacred, a retelling by a congregation; they tell the story of the girl who fled her tribe, and who became a deity. Back to literature being myth making, I think I should also tell you, I made up a lot of these stories. In other words, they don’t come from any specific tradition except for those which I’ve invented, culled together from many different places. I like the epistolary form because it allows me to write in a vulnerable, maybe even melodramatic voice. Letter writing is an intensely personal act, in which the writer (hopefully) rightfully assumes what she’s revealed in correspondence will be held in confidence. I also like that the physical act of handwriting the letter is very personal. So I wanted that direct address, or rather, I wanted my speaker engaged in this intimate mode, so that she could have these revealing, almost confessional moments of internal monologue. Of course, now these epistorlary poems are broadcast via the type set book, so there’s that contradiction. As far as punctuation, I am thinking of something Dan Langton, one of my professors at SFSU, said once, that the grammar of a poem need not abide by conventional grammar rules. Hearing that freed me to work more with tempo, and the effects of fragments and run-on’s, despite their technical incorrectness. So that’s what I’d also say I think about punctuation and oral storytelling. I’m curious about the relation between the poet, the story, and your multiple cultures. In “The Fire, Around Which We All Gather,” you write that poets are the keeper of words and stories, and the words grow strong like a bridge. Since your poems bring together myths from various traditions and of your own invention, do you see your work as a kind of bridging between different cultural stories? Do you feel this is something that reflects your own diasporic experience and diverse listenings? Is any story still a “pure product”? I think poetry (story, art) do bridge. “Always in a foreign country, the poet uses poetry as interpreter” (Jabès), right? Already, poetry is the thing which allows me to translate, understand, participate in this world, to be of this place. That may not be good enough for some; it does sound esoteric. But specific to my poetry, yes I do think of it as an effort to bridge my cultural and diasporic experiences. And really, it’s that neither here nor there, both here and there, not Filipino enough, not American enough feeling, which you may call diasporic or transnational experience, which informs my readings and listenings, and ultimately, my poetics. I am drawn to poems and stories in which the storyteller/poet uses the poem/story to figure out her state of being multiple and hybrid. It’s satisfying to see this worked out elegantly in language and form. I used to write in fracture, but now that doesn’t feel right, to accept an identity and language that is fracture (even using the term, “subtracted bilingual,” feels like acquiescing to fracure). So then “bridge,” could be its opposite. That said, “pure” is also relative. I still fret a little bit about my inauthenticity, that the Filipina people are expecting to see is not there within the pages of my books. My Tagalog is bad, my knowledge of Philippine culture and history is (inter)textual, my Philippine experiences are limited and highly mediated. I’ve resisted everyone’s efforts to gender me, socially condition me as the proper Filipina. So I am conscious that in inventing myths or remythologizing, my poems may be speaking out of turn and inappropriately. The kind of reverence I exhibit in Diwata for my elders and story is something I’ve tried to negotiate on my own terms. I don’t know that I’ve told these stories “correctly” or “incorrectly.” I also don’t know who holds the right to gauge the authenticity, the purity of a story. So then stories are “pure,” in that the way we tell them is the only way that we would tell them. Until the next telling. One thing I love about your work is that every book you publish seems to move deeper and deeper. For example, Poeta in San Francisco seemed to unfold from and deepen some of the key concerns articulated in your first book, Gravities of Center. Similarly, Diwata seems to unfold from and deepen the mythic thread that is present in Poeta. There’s a palpable gravity to this movement, a resonant voice--a poeta--who speaks from within the City (as space/time) and continues to call the diwata. How would you describe the movement of your first three books? What can we look forward to in your next book? Thanks for such a concise telling of my poetic trajectory! You are right, that the next book develops from an idea or theme articulated in the previous book. I think about the development of the speaker, from girl (autobiographical, individual self) to poeta (scribe, witness) to diwata (muse, deity). I think of Gravities of Center as a collage of numerous poetic and thematic concerns. In many ways, Poeta en San Francisco is a more concentrated rearticulation of the themes in Gravities of Center -- a Pinay making sense of coming of age within a specific history and geography. Poeta’s speaker is more intense and grave, more defiant, more righteously, politically angry than Gravities’ speaker, who is youthful, maybe naive. The speaker’s political anger in Gravities is also young and naive. In Diwata, I do not think my speaker has achieved transcendence, although I think she does keep her cool rather than fracturing or self-immolating, as my previous speakers have done. There’s wisdom to be found while attempting to unearth the roots of a people, of a self, of a historical problem, and there is defiance in reconfiguring the origin stories, which is what Diwata is doing. Now, I have two different projects. The first project goes back to city (no doubt, influenced by my husband Oscar Bermeo’s work on his manuscript, Anywhere Avenue), and really trying to peel back the layers of the place. Instead of dwelling on diasporic homelessness, this current work is a meditation on both Manila and Oakland, two of my “homes.” For the Manila portion of this project, I started riffing off historical Indo-Malay names for the place, prayers to patron saints, and Jose Rizal’s lyrical verses, praise for the river which gave the people and the city its names, then lamentation of man-made environmental catastrophe -- the dead Pasig River, and what it means for this river to be a dead lifeline of the people and the city. What emerged is a persona, a transnational and historically ubiquitous, groovy and iconoclastic Black Jesus. He started with my readings on the North American origins of the Black Nazareno statue in Quiapo Church; legend has it he was carved in Mexico by “an unknown Aztec carpenter,” brought to the islands via the Spanish galleons, and now revered as he grants miracles (he has something of a counterpart in the town of Petatlán, along the west coast of Mexico, along the galleon trade route). In my poems, he borrows from Langston Hughes and Bob Marley because he’s morphed into an African American Buffalo Soldier of the Philippine American War, who was deployed from the Presidio in San Francisco (some of these Buffalo Soldiers defected from the US Army and joined the Katipunan, fighting against American occupation). This funky transnationalism continues as my Black Jesus has taken on some qualities of our venerated San Francisco Pinoy poet, Al Robles. Now, Black Jesus has become my eyes, ears, and mouthpiece on the city that is my birthplace. I’m totally loving writing him. His diction is like loosening my tie: “Say, little sister, say, kayumanggi youngblood...” And now, I’m starting to see him all over Oakland too. My second project is a collective Pinay narrative, in which I’ve cup-up, remixed, collaged, “translated” the words, stories, and genealogies of other Pinays (which I have solicited from them) into a series of questions and answers, litanies, prayers, incantations. It is an exploration of what collective Pinay voice sounds like, what collective Pinay concerns are. A guiding principle for this work is “Pinayism,” a term coined by Allyson Tintiangco-Cubales, a local Pinay educator. Pinayism is not simply Filipina feminism or Filipina womanism, but more importantly, an interrogation of “the competition and distrust that often inhibit Pinay collective unity and activism” (Melinda L. de Jesus, Pinay Power: Theorizing the Filipina/American Experience). Some of my guiding texts are Anne Waldman’s “Fast Speaking Woman,” Claire Kageyama-Ramakrishnan’s “One Question, Several Answers,” and Bhanu Kapil’s The Vertical Interrogation of Strangers. There’s a theme of asking, inviting, even demanding that women speak, reveal, and represent themselves. With this project, I am exercising my poetic “we,” trying my best to write within the Filipino world view of pakikisama and bayanihan, both of which prioritize cooperation, community, and collectivity over individual motivation and accomplishment. So you could say I’m continuing to fine tune some aspects of my previous work, simply figuring out this Pinay’s place among her community and in the world.